PARIS – There was a verbal altercation, a dozen stab wounds, blood and shouts. The scene happened in a parking lot in northern France earlier this year. The list of characters reads like old Vaudeville: Marc, a factory employee and jealous husband, claimed to be “coincidentally” driving his car past a car park where his wife and another man were having a tender chat. Surprise. Confrontation. A tense discussion. And then violence. The man who could suitably be described as the lover was injured seriously and given six months of work disability. Marc, who has since been charged with “intentional assault and battery,” “wanted to teach him a lesson,” one of his somewhat embarrassed relatives says. The case, which will soon be judged in court, would be dolefully common if there wasn’t an unprecedented factor. In reality, the explosive encounter had nothing to do with chance: Marc, who had already been convicted of domestic violence, had installed a tracking app he allegedly bought for less than 100 euros on his wife’s smartphone. The gadget allowed him to follow her in real time. And like intelligence agencies that secretly use illegal devices, Marc then tried to claim that a simple, unfortunate coincidence had led to the confrontation. Intelligence legislation recently introduced in France creates a giant gray area in terms of what’s legal and what’s prohibited. The simple answer is that most spying between individuals is illegal, but there are some exceptions, such as when parents want to track their children’s media use or watch how child care workers are treating them. Unlike administrative wiretapping and judicial interceptions, which are statistically counted, it’s impossible to know just how much private spying goes on. For instance, the legal staff at the French National Commission for Data Protection and Civil Liberties (CNIL) now receives “at least one call per week” from men or women complaining that a relative has violated their privacy. “In divorce cases, there is often access to personal files or messages to prove that [one party] has a lover or hidden incomes,” the agency says. One expert says that new technology has created an overwhelming amount of “sensitive material,” whether it’s official or black market. For the former, authorization requests by state administrations or large companies to use sensitive material are booming. In 2014, the French agency responsible for answering such requests issued 1,205 decisions, twice as many as five years ago. For private individuals, these devices are proliferating in specialized shops that are flourishing in France. 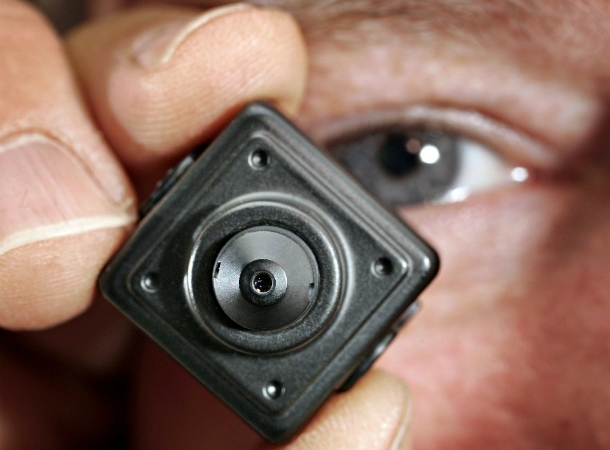 There are GPS trackers used under vehicles to follow them in real time (starting at 100 euros), microphones that can be hidden in a room or a bag for remote listening (from 50 euros), miniature cameras to hide in lamps or coat racks to record and watch able to watch comings and goings (from 30 euros). More impressive still are USB keys that make it possible to recover automatically any deleted files and conversations on any instant messaging service, on a computer or a smartphone (from 95 euros), or even crack any password (from 170 euros). The paradox is that while this material is sold over the counter, it is mostly illegal. “My customers are mostly looking for ways to watch their children,” says Farid Mlin, manager of the shop Espionnage-securite.com, based in Toulouse, conveniently citiing one of the allowed ways these technologies can be used. Violations can lead to a one-year prison sentence and a 45,000-euro fine. You’d almost think uncontrolled and unlimited surveillance is the new way to get rich. “You have a right to know,” the website Flexispy proclaims. The American company based in the Seychelles offers software for 60 euros a month that allows people to spy on smartphones in real time: to intercept a phone’s calls, to read all the sent and received messages (texts, Facebook and WhatsApp), to see which websites have been visited, to read emails. Worse still, the spying software can geolocate the target at any time, and even see through the camera and activate the microphone to listen to the surroundings. But to use this software, it is necessary to hack the target phone, to change the system designed by Google or Apple and replace it with a pirated version that looks and functions exactly the same. It’s difficult to rely on a phone pass code to prevent a possible spy, because more than half of users use the same password for everything (and 79% of couples share their passwords). In any case, there is software capable of cracking passwords. A few major manufacturers now share the “spying material” market between them. Israeli company Septier produces products for telecommunications interception and phone geolocation for intelligence agencies. Russian company TSMarket develops all kinds of recording devices (audio and video) for official services and private individuals, and the U.S.-based Paraben Corporation creates keys capable of recovering all kinds of files on computers or phones. But in the small retail shops, most of the products are made in China because they’re less expensive. “It’s very easy to find a GPS tracker made in China for 50 euros, with the same functions as ours,” says an official for the French company Stancom, which produces trackers that can geolocate vehicles. They are sold between 200 and 400 euros, “only” to private companies. There is no regulation of these imported gadgets, even less so given that a significant number of these devices are sent through individual mail after online purchases. In Toulouse, the manager of the espionage-sécurité shop is annoyed by this. “My friends who sell e-cigarettes make much more money,” he says. “Most of all, it’s hard to compete with the prices of websites abroad that don’t pay VAT,” or value-added taxes. The online shop 1001Espions.com is probably the top seller for this market. Based in Florida, the website is translated into French and offers a hotline with a French phone number. Its brochure is full of products designed to track, film, listen and conceal. “Today, what delinquents and police officers really have in common is this: They all want to be Inspector Gadget,” a lawyer working on organized crime cases says. “Geolocation or tracking apps hold no secrets for them anymore. They use hidden microphones or cameras. There are even scramblers for electronic tags appearing!” They too are sold on websites based abroad. Authorities are well aware of the dangers. “The facility with which some private individuals, including in organized crime, gain access to this type of material is more than ever evidence that we need stronger vigilance,” reads a particularly alarming recommendation by the National Commission for the Interception of Telecommunications. Whether you’re a police officer or a delinquent, the origin of illicit information must be concealed. Private individuals who spy also have to cover their tracks. The case of Marc and his cheating wife will no doubt be among the precedents for forthcoming cases.